Jamieson 100% Complete Multivitamin for Women 50+ is the easy way to get 100% of your body's daily vitamin needs. 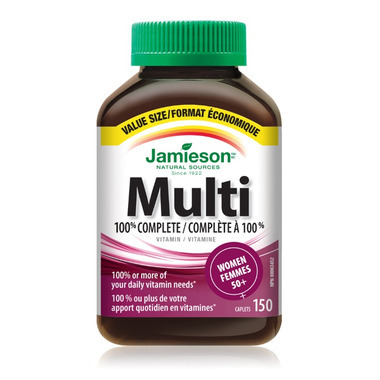 Formulated to Health Canada’s recommendation, Jamieson 100% Complete Multivitamin for Women 50+ also includes lutein for vision support, so you can feel confident you are getting 100% or more of the vitamins your body needs each day. Suggested Use: Take 1 caplet daily with a meal. Caution: This product contains enough drug (iron) to seriously harm a child. Keep out of reach of children. Consult a health care practitioner prior to use if you are taking blood thinners or if you have a history of kidney stones. This has been my best multi vitamin purchase-so far. This is my go to vitamine which makes me take on every day with energy.